New York, New York, U.S.A.: Harmony Books, 1999. Book. Fine. Hardcover. Signed by Author(s). 1ST. 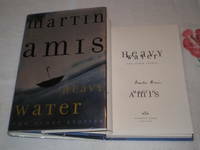 An Outstanding Copy - Signed By Martin Amis On The Title Page. Signature Only. A First Edition, First Printing, With The Corresponding Number Line. Book Is In Fine Condition. Boards Are Clean, Not Bumped. Fore Edges Are Clean. Interior Is Clean And Legible. Not Remaindered. Dust Jacket Is In Fine Condition. Not Chipped Or Crinkled. Not Price Clipped. Dust Jacket Is Covered By Mylar Brodart. Thanks And Enjoy..